How Long Does Watermelon Last? - The Shelf Life of a Watermelon - What About Watermelon? Have you ever wondered what the shelf life of a watermelon is? Or wondered why cut quarters of melon are placed in the refrigerator at your local grocer, rather than with their whole sisters on the shelf? This article will answer these questions and help you keep your melon fresher for longer. Just like any other fruit, watermelon will go bad after some time. The shelf life of a watermelon ultimately depends on how it was stored prior to purchase and how you will be storing it once you take it home. While some of us purchase a whole melon, the majority of us tend to purchase a watermelon that has already been cut. Most large chain grocery stalls will offer watermelon in quarters, halves and whole. When you purchase a whole watermelon that has not been refrigerated you can expect it to last between 7 to 10 days. If you were to refrigerate your melon prior to cutting it, you can expect to still be able to eat a juicy watermelon after 2 to 3 weeks. If you purchase a quarter or half of a watermelon from the refrigerator section of your local grocer you should place it straight back into the fridge once you return home. Cut watermelon should only be left on the counter when it is intended to be consumed within a few hours. Cut watermelon can be left in the refrigerator for up to five days before it begins to turn bad. 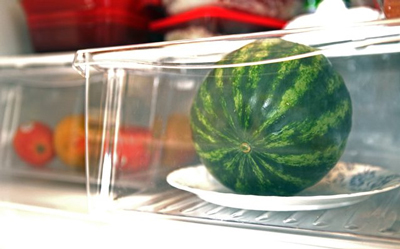 Watermelon that is placed in the fridge should be stored in an air tight container or covered fully with cling wrap. If you have purchased more watermelon than you or your family can consume in a week, another alternative is freezing the left overs. Simply cut the left overs into cubes and place them in your freezer. Cut watermelon can last up to twelve months once frozen. Below you can find the recommended shelf life for cut and whole watermelon. Off or spoilt watermelon will not only look discolored but will also carry a bad odor. Watermelon that appears off or has mold growing on it should be discarded. Ensure you do not eat watermelon past the recommended expiry dates suggested above. After this time period, there is a good chance that your watermelon will go bad even if there are no obvious signs. Eating bad watermelon can increase your chance of getting sick with a food borne illness. When you are choosing your watermelon, avoid fruits that have dark spots. These spots can indicate the start of mold or spoiling of the watermelon. Always choose whole watermelons that appear symmetrical. You can find out more about more about picking the best melon here.